TANGEDCO Limited Has Published Job Advertisement For 18 Management trainee Posts, Kindly Request To All Candidates That Read All Important Content Of This Job Carefully Before Applying For This Job And Last Date For This Job Is 31-07-2017. Age Limit - Candidates Applicant Age Should Not Exceed 28 Years as on 01-07-2016. Age Relaxation As Per Rules Will Be Applied. For More Information On The Age Of The Posts Published Advertisement. 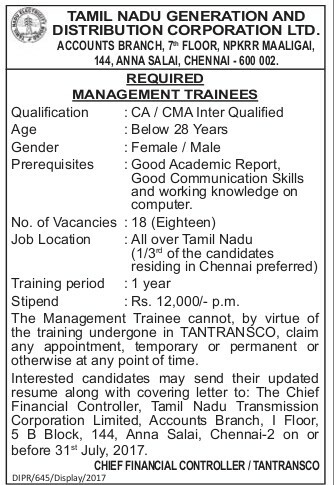 Qualification For This Job :- (CA / CMA Inter + knowledge of the Tamil language) Valid For This Job,For Whole Information About This Job Read Published Advertisement Copy given below this post.